Add some very to your merry at the veriest, merriest Christmas party of the season. Mickey’s Very Merry Christmas Party at Magic Kingdom hosts 20 nights of yuletide cheer from November 8 – December 18, 2015. 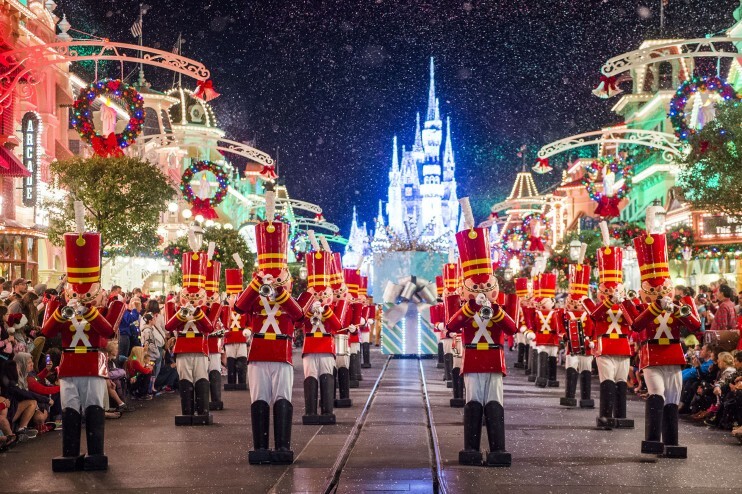 From 7pm to 12am during select nights at Magic Kingdom park, this annual ticket event will bring Christmas joy to guests of all ages with festive decorations, towering Christmas trees, and wintry wonderful entertainment. Beginning at 7pm (after regular park hours), guests with special event tickets can enjoy the spectacular holiday splendor, along with complimentary cookies and hot cocoa, and snow flurries on Main Street, U.S.A. Special holiday entertainment during the event includes Mickey’s Once Upon a Christmastime Parade, A Totally Tomorrowland Christmas! Dance Party, “Celebrate the Season” musical stage show starring favorite Disney characters, and “Holiday Wishes: Celebrate the Spirit of the Season” fireworks spectacular. A spectacular light display boasting millions of glittering lights, the Osborne Family Spectacle of Dancing Lights is perfectly synchronized to a high-energy holiday symphony. This magical display of Christmas lights can be seen on the Streets of America at Disney’s Hollywood Studios from November 6, 2015 through January 3, 2016. One of the most beloved holiday traditions at Epcot, the Candlelight Processional inspires guests and instills the Christmas spirit through the retelling of the Christmas story by celebrity narrators, accompanied by a masterful orchestra and choir. The Candlelight Processional is performed three times each evening, 5:00pm, 6:45pm and 8pm, from November 27 to December 30. Guests become immersed in holiday festivities while experiencing holiday traditions from various countries throughout World Showcase during Holidays Around the World November 27 – December 30. Share in the sights and sounds of the nations of World Showcase as each country’s holiday heritage comes to life amid joyful music, interactive storytelling and time-honored traditions. Are you visiting Disney World during the holidays? If it wasn’t for pressures of business timing, I would have arranged our visit to Walt Disney World at some time other than middle of November. Alas, the visit will be worse for all this over-the-top glitter.